Every day on the internet we are constantly bombarded with new information. Some have deemed it the "information revolution", because so much data is being created with every passing second. Between social media updates, blog posts, news sources, and email, we are drowning in data. And not only is it increasing, but it is increasing at an exponential rate. With information flying, sometimes it is hard to tell what content is worthwhile and what is not. This week's top 5 infographics are about information overload, stating some staggering facts about how much data is created daily, and then offering some tips on how to overcome this information overload. The internet is only 23 years old, but already every 60 seconds 160 million emails are sent, 1,500 blog entries are created, and 98,000 tweets are shared. The average worker spends 28% of the work week managing emails, which is the equivalent of 560 hours per year. Streamline your focus by prioritizing tasks, mastering your time, separate your work email from other, and disconnect every so often so you can stay refreshed. 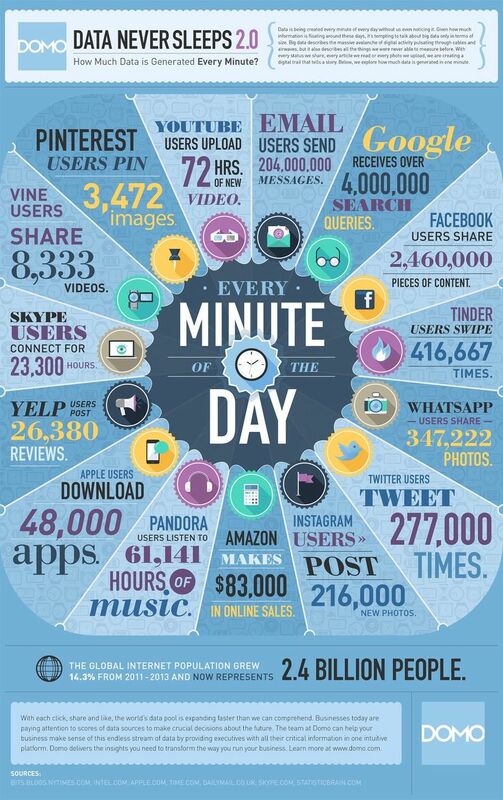 Every minute of the day, Google receives over 4,000,000 search queries, Facebook users share 2,460,000 pieces of content, and Vine users share 8,333 videos. YouTube users upload 72 hours of new video every 60 seconds. Every minute, Apple users download 48,000 apps. Pandora users listen to 61, 141 hours of music, and Instagram users post 216,000 new photos. 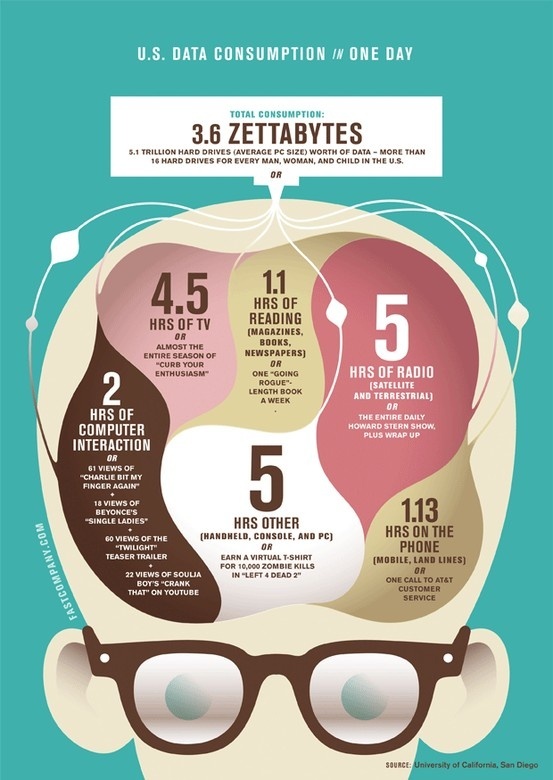 15 terabytes of information is produced every single day. 20% are structured results. A typical online search produces 564,768 results. One of the main reasons for information overload is that the number of indexed websites grows by several billion every single day. Total data consumption in one day in the US is equal to 3.6 zettabytes, or 4.5 hours of TV, 1.1 hours of reading, or 5 hours of radio. In addition, that's equal to 2 hours of computer interaction, or 1.13 hours on the phone. The internet is so big, it is incomprehensible. Google has indexed 200TB of the internet's data, and that's just an estimated 0.004% of the total internet. Americans spend an average of $717,808,219 every day on online purchase. YouTube is perhaps the most popular entertainment form of them all. If you were to watch all of the videos uploaded in one day, it would take you 16 years.